In what is likely its most dramatic and successful operation to date, the Mexican Navy seized a beach in Cancun on July 30, not to retake it from a foreign enemy but to get the sand back. 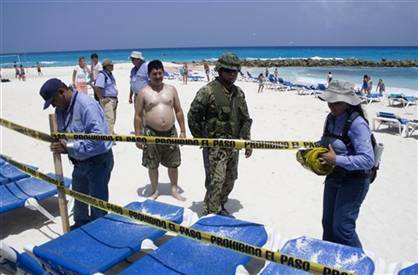 Tourists at the Gran Caribe Real Hotel woke up to find armed sailors stationed on their beach, which had been cordoned off with police tape. Apparently, many Cancun beaches were replaced after a 2005 hurricane washed the sand away, but the new sand is not staying put. So property owners have allegedly been using pumps to steal sand from other hotels, and building illegal breakwaters to keep it from flowing back. The invasion last Thursday was designed to secure the beach and stop the illegal sand accumulation. "Today we made the decision to close this stretch of ill-gotten, illegally accumulated sand," said Mexico's attorney general for environmental protection. "This hotel was telling its tourists: 'Come here, I have sand . . . the other hotels don't, because I stole it." He said that five hotel employees had been detained for using pumps to steal the powdery-white sand from the beach next door. The experience gained in stopping this powdery-white substance from flowing over this particular border may, or may not, come in handy elsewhere. But the beach is secure for now.